Why Did Western Nations Continue to Prosper in the 20th Century even though Fiscal Burdens Increased? In the pre-World War I era, the fiscal burden of government was very modest in North America and Western Europe. Total government spending consumed only about 10 percent of economic output, most nations were free from the plague of the income tax, and the value-added tax hadn’t even been invented. Today, by contrast, every major nation has an onerous income tax and the VAT is ubiquitous. These punitive tax systems exist largely because – on average – the burden of government spending now consumes more than 40 percent of GDP. To be blunt, fiscal policy has moved dramatically in the wrong direction over the past 100-plus years. And thanks to demographic change and poorly designed entitlement programs, things are going to get much worse according to BIS, OECD, and IMF projections. While these numbers, both past and future, are a bit depressing, they also present a challenge to advocates of small government. If taxes and spending are bad for growth, why did the United States (and other nations in the Western world) enjoy considerable prosperity all through the 20th Century? I sometimes get asked this question after speeches or panel discussions on fiscal policy. In some cases, the person making the inquiry is genuinely curious. In other cases, it’s a leftist asking a “gotcha” question. I’ve generally had two responses. 1. The European fiscal crisis shows that the chickens have finally come home to roost. More specifically, the private economy can withstand a lot of bad policy, but there is a tipping point at which big government leads to massive societal damage. 2. Bad fiscal policy has been offset by good reforms in other areas. More specifically, I explain that there are five major policy factors that determine economic performance and I assert that bad developments in fiscal policy have been offset by improvements in trade policy, regulatory policy, monetary policy, and rule of law/property rights. I think the first response is reasonably effective. It’s hard for statists to deny that big government has created a fiscal and economic nightmare in many European nations. But I’ve never been satisfied with the second response because I haven’t had the necessary data to prove my assertion. However, thanks to Professor Leandro Prados de la Escosura in Madrid, that’s no longer the case. 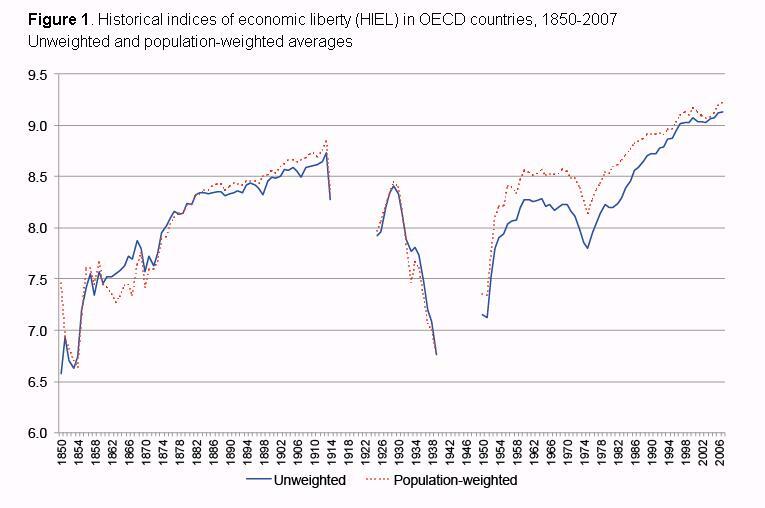 He’s put together some fascinating data measuring economic freedom in North America and Western Europe from 1850-present. And since he doesn’t include fiscal policy, we can see the degree to which there have been improvements in other areas that might offset the rising burden of taxes and spending. 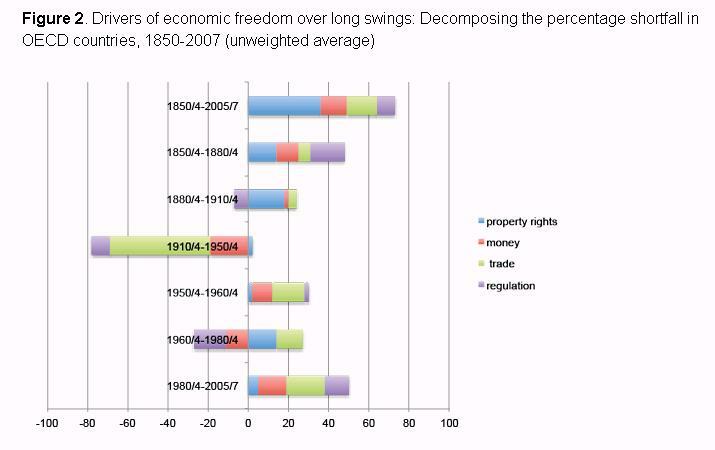 Here’s one of his charts, which shows the growth of economic freedom over time. For obvious reasons, he doesn’t include the periods surrounding World War I and World War II, but those gaps don’t make much of a difference. You can clearly see that non-fiscal economic freedom has improved significantly over the past 150-plus years. Most of the improvement took place in two stages, before 1910 and after 1980. It’s also worth noting that things got much worse during the 1930s, so it appears the developed world suffered from the same bad policies that Hoover and FDR were imposing in the United States. Indeed, here’s another chart, which highlights various periods and shows which policies were moving in the right direction or wrong direction. As you can see, the West enjoyed the biggest improvements between 1850-1880 and after 1980 (let’s give thanks to Reagan and Thatcher). There also were modest improvements in 1880-1910 and 1950-1960. But there was a big drop in freedom between the World War I and World War II, and you can also see policy stagnation in the 1960s and 1970s. By the way, I wonder what we would see if we had data from 2007-2014. Based on the statist policies of Bush and Obama, as well as bad policy in other major nations such as France and Japan, it’s quite likely that the line would be heading in the wrong direction. The moral of the story is that we’ve been lucky. Bad fiscal policy has been offset by better policy in other areas. We’re suffering from bigger government, but at least we’ve moved in the direction of free markets. That being said, we may now be in an era when bad fiscal policy augments bad policy in other areas. For further information, this video explains the components of economic success. P.S. I’ve written before that government bureaucrats don’t work as hard as folks employed in the economy’s productive sector. Well, that’s becoming official policy in some parts of Sweden. A section of employees of the municipality of Gothenburg will now work an hour less a day… The measure is being self-consciously conceived of as an experiment, with a group of municipal employees working fewer hours and a control group working regular hours – all on the same pay. …Mats Pilhem, the city’s Left-wing deputy mayor, told The Local Sweden that he hoped “staff members would take fewer sick days and feel better mentally and physically after working shorter days”. Heck, if you want fewer sick days, just tell them they never have to show up for work. And I’m sure they’ll “feel better mentally and physically” with that schedule. I’m also amused by this passage from the article. Anna Coote, Head of Social Policy at the New Economics Foundation, a UK-based think tank, welcomed the proposals. “Shorter working hours create a more committed and stable workforce,” Ms Coote told The Telegraph. Gee, what a surprise. If you overpay a group of people and tell them they can spend more time at home, they’ll be very anxious to keep those jobs. Sounds like a great deal…unless you’re a taxpayer. 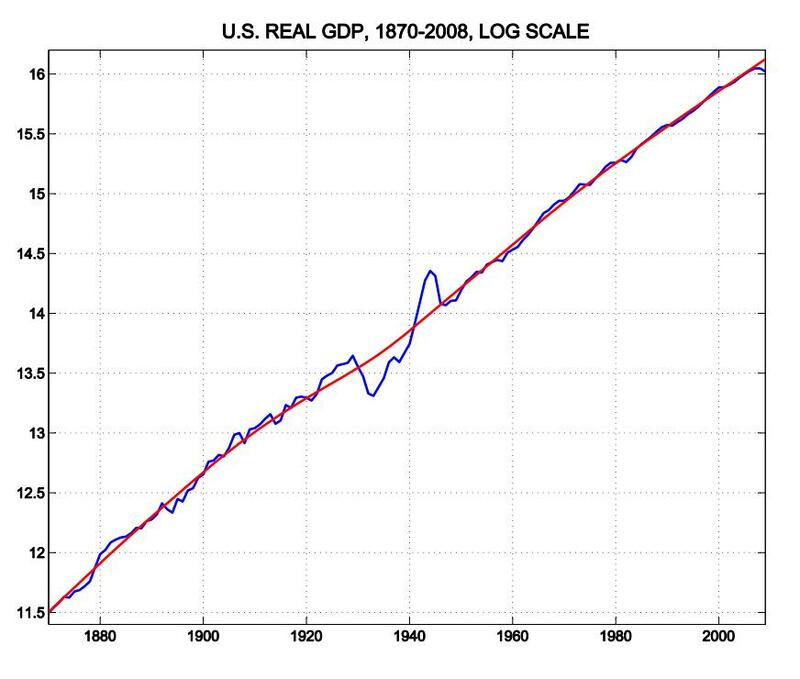 One reason “the United States (and other nations in the Western world) enjoy considerable prosperity all through the 20th Century” is simply technological progress, improvements in which significantly improved prosperity. Reliable electricity, refrigeration, telephones, transistors, antibiotics and other advances increased living standards. Thus, government took more from us, and captured many of the technological benefits, via increased taxation. That people’s living standards didn’t decline (and instead were rising from technological improvements) allowed government to get away with it. It’s hard for many to realize what prosperity could have been like, when they never got to see the gains for themselves. This is coming a bit late, but it seems like the simplest answer is that growth occurred due to innovation in the private sector *despite* the growth of government rather than because of it, and that there would have been faster growth with smaller government. Trying to quantify good fiscal policy offsetting bad isn’t easy obviously , the tradeoff “seen vs the unseen” is hard to demonstrate on a country-wide whole economy scale. I’d say it is better to focus n the principles and reasons that free markets are what lead to growth. Use specific concrete examples of particular industries and policies to illustrate the point. The “unseen” cost (and consideration of what might have happened if it hadn’t been there) is unfortunately hard to demonstrate with the sort of studies you are talking about. Technological advancement and other factors that contribute to growth vary over time it seems very difficulty to look at different time periods and try to compare policies and growth rates between them to isolate a cause, the complexity of the analysis seems to leave the potential for much critique (valid or not) to confuse the issue in the minds of a public not delving into the minute details of studies. Cross country comparisons are a little better since at least they are dealing with the same state of science&technology.. except of course the spread of that technology to each country varies in the timing of its adoption. It is also obviously difficult to do given the different mixes of policies, some of which are good, some of which aren’t, and varied impacts of technologies and resources depending on the particulars of the production in each country, and variations in culture. Many thanks for this post, and btw that reminds me that i never thanked you for the post on the history of thought on jurisdictional competition from last year. * The fact that Professor Prados de la Escosura does not include taxation+spending should be given more emphasis. * It’s a pity that the full article is gated: it would be interesting to see where freedom has increased and where it has decreased. I fear that the biggest decreases, or smallest increases, might well have occurred in the 2 countries responsible (by way of their foreign policies) for the overall increase: the UK and the US. * Professor Prados de la Escosura probably understates the worldwide increase in freedom by focusing in the OECD: it’s a pretty safe bet that the rest of the world has seen an even bigger increase in freedom. That increase in freedom outside the OECD has likely benefited the OECD countries as well, just as the increased fredom in the OECD has benefited the rest of the world. * Contrary to the implication in Zorba’s comment, economic growth cannot be taken for granted: indeed, significant economic growth is pretty much an anomaly of the last few centuries. I do agree with the main trend of Zorba’s comment, though. While it is difficult to untangle the macro world into a few basic themes, several positive themes resonated to combat the dead hand of government. As Zorba mentions, private sector innovation not only brought new products to market but management innovation brought efficient ways to get those products and services to market. Communications from telephones to radio to TV to cell phones to the internet brought dramatic acceleration in the speed of decision making, to the point where knowledge work now dominates physical production. Whereas improvements in physical production brought step function productivity improvements, networks are creating geometric progressions. Another positive influence was personal motivation. The “War to End All Wars” stimulated the 1920’s. The Depression closely followed by WWII created a world where hard work was expected and the US had productive capacity that the rest of the world lacked. In the 70’s the welfare state and growing government reduced the incentive to work. Reagan and the 80’s rekindled that motivation, which continued through the 90’s. Disincentives created by government destruction of economic freedoms will be a huge problem in the 21st century. The simple existence of growth is a low bar by which to judge good policy. After all even the soviets grew and one could argue, that all summed, life in Russia was better in 1970 compared to 1910. So growth is there on a global level and not only is there but has been accelerating. Even Venezuelans, Cubans and Burmese are likely to be better off in a century, even if they don’t change regimes and remain mired in the oppression of coercive collectivism. The issue is not whether there is growth, but how does your growth compare to that of other nations. Smaller governments are growing faster. 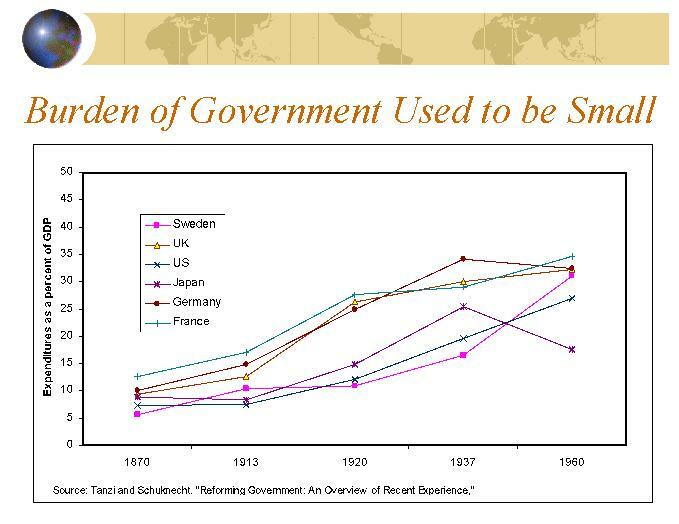 Smaller governments are typically associated with steeper, less adulterated, effort-reward curves, more motivation, greater ability to own the fruits of your labor, less insulation from the consequences of mediocrity, and hence faster growth. This ever faster growth is especially so today where innovations and their commercialization can be leveraged to spread worldwide, bettering the lives of billions, in short order. Today, a person who discovers an new therapy which can now spread globally in a mere few years, has an impact, i.e. an effective productivity that is hundreds of thousands of times greater than a person shoveling dirt at one of Obama’s shovel-ready projects. It makes sense that his compensation should be allowed to grow equally disproportionate, in order to avoid flattening the effort-reward curves. But when we insist on capping that compensation to multiples of one hundred, or so, we are inevitably flattening the effort-reward curve. Flattening it where it matters most, where the inventions and commercializations that affect billions happen. Many people don’t like this linear correlation between productivity and compensation and thus want to apply progressive measures to flatten the effort reward curve. That requires bigger government. Hope in redistribution is the wellsprings of big government. But it is very likely that whether your children live in a cancer free world by, say, 2060, or whether they may have to wait until 2080 for that, may very well depend on leaving the natural effort-reward curve unadulterated. Most people will not go for that, hence most western world voter-lemming democracies will continue to exhibit a growth deficit compared to the world average, and their once exceptional standard of living will thus be absorbed into the fast rising world average.